Veryl Goodnight, Emergence, Bronze Edition of 25, 17" x 29" x 8"
In Fredericksburg, Texas, a group show featuring three unique and exceptional artists including Veryl Goodnight opens May 1, 2009 in conjunction with First Friday Art Walk Fredericksburg and runs through the month. “One of the reasons we grouped these national artists together was because of their unique perspective in capturing everyday life on canvas or in bronze,” says Sandy Nigh. “...Goodnight creates exceptional 3-D bronzes from a moment in time.” For over three decades, animals and the American West have been sculptor Veryl Goodnight’s main artistic focus. For the May group show, Goodnight presents two new bronzes, Emergence and Radar. Inspiration for Emergence came from a mule deer raising two fawns right outside Goodnight’s studio in Colorado. 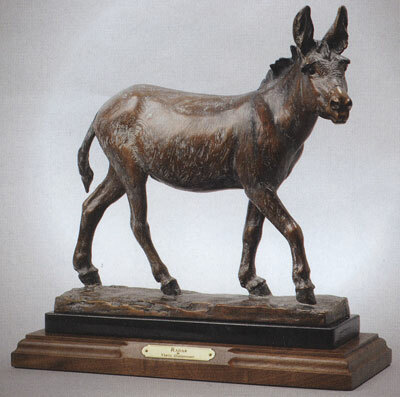 Veryl Goodnight, Radar, Bronze Edition of 30, 12" x 13" x 5"
A humble little burro is the focus the artist captures in Radar, a favorite subject for Goodnight throughout her sculpture and painting career. “I am fortunate to have several great models nearby,” says Goodnight. “Radar was sculpted outdoors under the critical supervision of another burro, Angus, and their pal, Hank the Percheron.” Goodnight and her husband, Roger Brooks, live just north of Santa Fe, New Mexico, with a menagerie of animals. 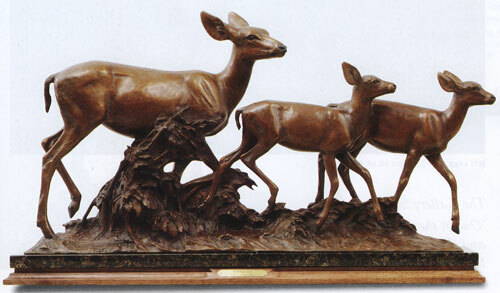 Her professional organizations include membership in the National Sculpture Society, The Society of Animal Artists, Northwest Rendezvous and The American Academy of Equine Art.